So this is part 1 of a story arc i’ve got for this week. This whole story was the result of what I thought would happen if I took over this dudes life. Again, my mind is crazy awesome. Part 2 Tomorrow. Anybody see Rise of the Planet of the Apes? I thought it was pretty good. I was happy to see Dr. Rodney Mckay in something other than Stargate: Atlantis. Also Tom Felton, Y U NO Liek Monkees? I tweeted this earlier this weekend but it warrants posting again because it is awesome. Seth Mcfarlane of Family guy fame is producing a sequel to Carl Sagan’s “Cosmos” . I’m a huge Sagan fan. He’s been an inspiration to myself and a lot of people I know. So to hear that his tradition is being continued, with Neil deGrasse Tyson narrating no less. The only thing I see going against it is the fact that it’s on FOX. Now that’s probably a needed place for a prime time Science show but I also see it not doing well because it’s a Science show on FOX. Oh well, we’ll see how it turns out. You can follow me on Twitter or check out my deviantart page for more artworks. I need a chair like that. 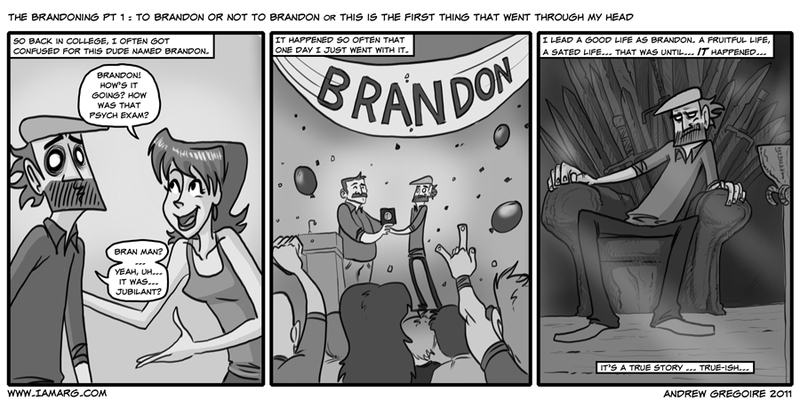 Also, I think I remember this whole Brandon thing back in College… assuming you meant that college. Brandon is a Stark name, though. Ah, to be confused with someone! I wouldn’t know, of course. I tend to not get confused with people because I stand out. I like to think in a good way, but honestly, I don’t! Har. lol so you do don’t not do stand out fit in?